MLK’s words above seem to resonate well with some of the underlying triggers of the avoidable auto carnage on the nation’s roadways. No doubt, most of the road fatalities are the result of unpardonable human errors, all of which appear to be grounded in “sincere ignorance and conscientious stupidity” that the late American human rights legend once used to bemoan why people choose to do immoral things in the face of righteous deeds. Let all of us as Ghanaians understand that we have a common national destiny; because, we sink together as a nation. This calls for an urgent need to strive to cut off years of denials, makeshift solutions pursued to complex problems, our usual blame games; and rather, make systematic effort to harvest cultural attitudes that run counter to callous indifference and the self-destructive mood swings happening on our roads day in and day out. Who in Ghana today doesn’t know the deadly auto murders on the nation’s highways predate and will outlive any ruling government? 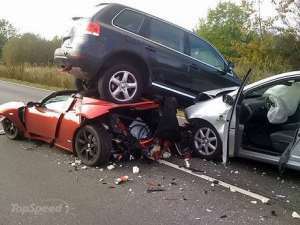 According to one of the MTTU accident statistics, the year between 2007 and 2010, “at least 6,000 people had died due to road accidents with an additional 40,000 injured within the same interval. This is why we need to separate the fictions of the gruesome auto accidents from cold facts and realities. Let’s draw a bold line between politics as usual and the serious policies facing the Ghana. Surely, one can argue about the frequency as well as the severity of these accidents under a particular government. But, still, the prevailing gory reports of Ghana’s auto accidents do not change the age-old reality that one of the existential threats bedeviling this nation over the decades is a culmination of willful, or call it “sincere ignorance” and “conscientious stupidity” parasitically sucking the blood of rationality out of millions of Ghanaians, especially when some of us get behind the steering wheels. Dr. King’s observation here may have myriad interpretations. Nonetheless, it is extremely difficult to overlook the link the quotation has with the average Ghanaians’ national mindset or thought process. It’s because there is this seemingly unstated belief imbedded into the country’s socio-cultural ethos that somehow accept that the auto-destructive behaviors on our deathtrap roads offend the 21st century sense of human dignity; but, by the same token, there is this general resignation in Ghana that the road carnages are unfortunate part of the traffic mores in the country. So whenever people lost their precious lives tragically in avertible vehicular accidents as is happening almost daily throughout the country, as usual the screaming media and many Ghanaians become morally outraged, followed by buck passing and lip services about what needed to be done. The next phase comes the pretext as if Ghanaians have learned any useful lesson from the preventable auto deaths that can seriously lead to motivate the moral consciences of the nation to institute far-reaching measures to minimally control the barbaric accidents unfolding on the dangerous traffic routes in Ghana. Clearly, it is sad trying to embrace the fact that a relatively tiny country such as Ghana with a population less than or nearly 30 million, in addition to not even having close to 4 million registered vehicles on its roads and highways, and yet keep experiencing high incidence of auto fatalities here and there. In relative terms, United States has about 270 million registered vehicles plying on its roads and expressways, according to the Office of Highway Policy Information report in 2016. But the significant fact is while in U.S., with all its countless vehicles and larger population, doesn’t record frequent deadliest auto accidents on its well-constructed, well-maintained, and bribe-free law enforced roads, in smaller Ghana the roads have become open morgues with disfigured still bodies. It is depressing spectacle witnessing almost on regular basis innocent and hardworking human beings losing their lives in such an inhumane circumstances while we look on hopelessly numb and shrouded in “sincere ignorance.” As if many Ghanaians have not become desensitized enough to the bloodbaths on our roads, one traumatizing by-product of these road tragedies border on the insensitive opportunists who usually try to exploit the carnage to score political points or engage in superstitious ramblings as well as spiritual pranks. Ghanaians dislike taking responsibility of their actions; yet many of us know better and capable of doing the right thing, but the question is when? For some inexplicable reasons, we keep behaving like the proverbial ostrich that buries its head in the sand and feigns nothing has happened. After over 60 years of self-rule from the Union Jack, what moral, rational, or socioeconomic justification can any serious Ghanaian make regarding the non-development of well-paved dual highways, at least connecting all the major or the regional capitals in this country? More so, how serious and smart are we as a nation with zero ambitions and lip services to world-class roads but we have insatiable appetite for Bentleys, Roll-Royces, Maseratis, and other exotic vehicles. In any event, not long ago somewhere in mid-2018, the Okyenhene, Osagyefuo Amoatia Ofori Panin escaped a near-fatal auto accident on his return to Kyebi from a family trip to Manhyia Palace in Kumasi. Some few days or so after the macabre incident, the Okyenhene made the following sincere and pragmatic suggestion in reaction to his traumatized ordeal in or around the Eastern Region town of Osino along Accra-Kumasi highway. Here is Osagyefuo Amoatia Ofori Panin in his own words: “If cars are passing one another at 130 kilometers per hour, it is a recipe for disaster. We are the only country [Ghana] in which if there is an accident, 20 to 30 people die… On this super highway between Accra and Kumasi, you always have 30 people dead when there is an accident. Elsewhere you can only hear of that number of deaths with airplanes. It is unacceptable” (Daily Graphic, June 17, 2018). What the OKyenhene is smartly underscoring is that all these horrible accidents and head-on collisions claiming huge death tolls on our killer roads can be avoided or substantially reduced if the country invests heavily in the constructions of divided highways or dual carriageways as many modern societies have done. And yes, Nana Amoatia Ofori Panin is more than right; elsewhere in America, UK, Canada, or even the “Johnny-come-lately societies” like Hong Kong, Dubai, Qatar, and so on, they will not sit and watch helplessly as auto accidents happen in successive fashion with large number of road mortalities while talking about witchcrafts. There may be several factors behind the auto carnage on Ghanaian roads and highways, but among the top five underlying theoretical reasons that tend to misinform our creative drive and social awareness with regard to genuine and contemporary road safety initiatives, the trappings of “sincere ignorance and conscientious stupidity” appear to hold sway. Bernard Asubonteng is a United States-based writer. This author has authored 133 publications on Modern Ghana. Dr. J.B. Danquah’s Deniers In Hyper-partisanship Overdrive Again! Gabby Okyere’s Questions Are Not Vilified In Critical Thinking Societies! Nana Akufo-Addo Will Lead Npp To The Slaughterhouse In 2016!